Let's say you're in Las Vegas and you're sitting in a multiple deck game where the soft doubling option is available. You draw the Ace and the seven, while the dealer shows the always tricky upcard of two. You have three options here - to hit, stand, or double. Which of these options do you exercise? Well, the hand of Ace-seven will leave you with a total of 18; that is if you decide not to do anything with it. The dealer, holding a two, would probably have to draw two ten-value cards in a row in order to bust. Otherwise, the great likelihood is that he's going to be able to make a hand for himself. In fact, the dealer has a bust rate of about 35% with an upcard of two; however, he'll only be able to beat a total of 18 approximately 37% of the time. So the bottom line is that he will beat you in 37% of the case scenarios, giving you about 49% winners (the rest are pushes). If you double down here, you're going to win at about the same rate, but you're going to lose a little over six more times out of every hundred instances. Sometimes the object of the game is to make the move that causes us to lose less times so that when we are in a beneficial situation, we're able to bring the overall percentages more toward our favor. 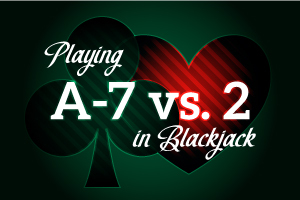 So while standing on the Ace-seven versus a two is not a play which is going to make you rich, it certainly beats the alternative, from a mathematical standpoint. That's why it's the move for you.